for the years 2010 to 2013.
to highlight further if there is any strength in the word 'Trust'. In 2014, IGS highlighted an article where Irish Greyhound Board Welfare Manager/Irish Retired Greyhound Trust Secretary, Barry Coleman, was 'passionate about making sure more greyhounds live out their days here[Ireland]'. But homing greyhounds in Ireland through the IRGT has not advanced since then, very few of the greyhounds homed via the IRGT have been homed in Ireland. The IRGT rely on European adoption agencies. Some adoption agencies want to help with greyhound homing but find the process difficult where some costs are not met, or not met fully, and are given(often)poor photos of greyhounds available/on a waiting list to show to potential adopters. 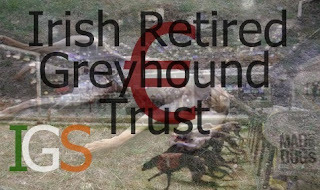 The IRGT website is poorly up-dated/confusing/conflicting in areas, there is no link to it via the IGB website, indeed the IRGT doesn't even have an adoption centre where greyhounds can be met by the public. Outside of Ireland, greyhounds are more welcomed as the beautiful animals they are and the beautiful companion animals they make. Sadly, In Ireland the main perceptions of greyhounds continue to be as of them being racing/working dogs. The main work of 'changing perceptions' in Ireland of, and for, greyhounds is left to be done by hard-working, dedicated, and often financially-exhausted, independent rescues/charities and not by the IRGT. included a clause that an IRGT centre would be built on the site. In November 2017 the IGB gave an interview on 4FM's Niall Boylan Show in a PR move to reassure the public on greyhound track injuries/deaths. The misleading figures/data backfired when the subject moves to greyhound adoption, Niall Boylan is clearly shocked. But even looking at the true figures, the IRGT(direct and assisted)greyhound homing figures are poor to say the least. 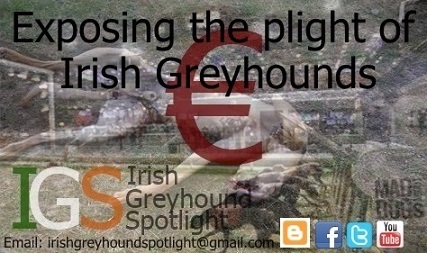 The Irish Coursing Club are responsible for registrations of greyhound litters in the Irish Greyhound Stud Book. Using the litter figures supplied by the ICC, and using the average of 6 pups per litter that they themselves use, we can see that at least 102,108 greyhounds were born in Ireland from 2011 to 2016. For the same years(2011 to 2016)figures supplied from the IRGT/IGB show that only 4,064 greyhounds were homed(directly and assisted)by the IRGT. it is clear there is so much more that the IRGT should be doing. In 2014 the damming Indecon report was published. Of the many serious recommendations for change within the racing industry, the report called for, was the recommendation for 'additional funds to be paid to the[Irish]Retired Greyhound Trust'. The 2014 IGB Annual Report shows IGB contribution to the IRGT was €221,051. In 2015 the IGB contribution to the IRGT declined to €206,381. In 2016 the IGB contribution to the IRGT rose from 2015 but still declined from 2014 to €217,306. Thankfully the IRGT would qualify for the charity tax-exemption status. The 2015 reported annual IRGT income was not much higher, in the scheme of things, than the hand-shake-pay-off of €116,000 the ex IGB CEO, Geraldine Larkin, was given at the termination of her contract in Dec 2016. Geraldine Larkin celebrated a €7k IGB industry investment in 2016, which included a €250,000 Breeders Scheme. A further interesting note is of Denis Healy being appointed as an IRGT Trustee in November 2017. You can hear Denis Healy speaking about how the IGB take welfare seriously, despite declines in doping tests, and declines in welfare inspections. front is PR that fails the industry tool: the beautiful Greyhound.